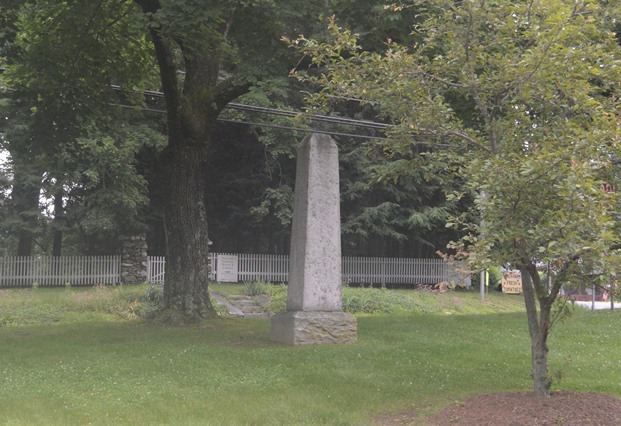 This monument on the Bethlehem green marks the location of the church where Joseph Bellamy preached. Bellamy was one of the leading Congregationalist pastors and theologians—as well as a prominent educator and writer—of the late 18th century. Born in Cheshire, Connecticut, in 1719, he graduated from Yale in 1735 and studied for a time under the famed minister of the Great Awakening, Jonathan Edwards. Bellamy was licensed to preach in 1738, at the age of 19. 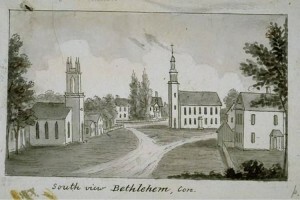 That same year Bethlehem, a community of 14 families, was granted “winter privileges.” Because of the poor nature of 18th-century roads, settlements were given the privilege of hiring their own minister for the winter months instead of traveling to the nearest established church. Bellamy began preaching on November 2nd of that year and, in 1740, formally became the town’s minister. It has been stated that no theologian of the time—except for Edwards—had the impact that Bellamy had. This was due largely to his teaching of theological students and the publication of his 22 books, which laid out the basic ideas of New Light Congregationalism. New Lights largely accepted the revival movements of the Great Awakening and, as such, brought political divisions to largely Old Light New England. In response to these divisions minister Gideon Hawley wrote to Bellamy in 1763 that he didn’t “know of but two clergymen however in the country that appear to like your principles.” In spite of his controversial views, Bellamy served as the pastor in Bethlehem for more than half a century, until his death in 1790. “Bellamy-Ferriday House & Garden.” CT Landmarks, 2016. Link. “Guide to the Joseph Bellamy Papers.” Yale University Library, 2016. Link. Bellamy, Joseph. A Careful and Strict Examination of the External Covenant, and of the Principles by Which It Is Supported a Reply to the Rev. Mr. Moses Mather’s Piece, Entituled, the Visible Church in Covenant with God, Further Illustrated, &c... New Haven: Printed by Thomas and Samuel Green, 1770. Link. Bellamy, Joseph. Sermons Upon the Following Subjects Viz. the Divinity of Jesus Christ. the Millenium [Sic]. the Wisdom of God, in the Permission of Sin. by Joseph Bellamy, A.M. Minister of the Gospel at Bethlem. Boston: Edes & Gill and by S. Kneeland, 1758. Link. Bellamy, Joseph. True Religion Delineated or, Experimental Religion, as Distinguished from Formality on the One Hand, and Enthusiasm on the Other, Set in a Scriptural and Rational Light.. Boston: S. Kneeland, 1750. Link.